Restaurateurs Chris Sullivan, Robert Basham, and Timothy Gannon knew they wanted an Australian theme for their new steakhouse and hunkered down to come up with a name. Robert's wife Beth pulled out her lipstick and started writing names on a mirror. "Outback" jumped out as the best name among the choices. While looking for Windex a little later, the group wondered why they didn't bother to look for a pen and a piece of paper. 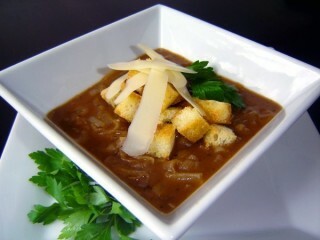 This creamy onion soup has become a favorite item on the Outback menu. With this formula, you'll get all the flavor of the original with only one-third the fat. 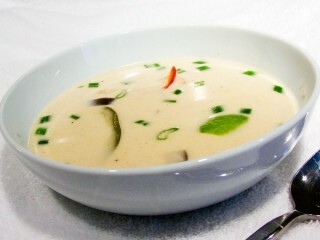 It's the white, creamy broth in the original version of this delicious soup that adds unnecessary fat grams. 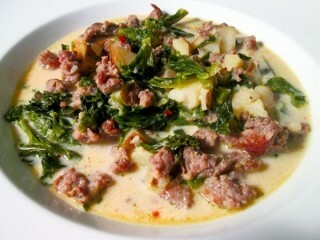 By replacing the fat-filled dairy ingredients from the original with fat-free milk and chicken broth, and by using lean Italian turkey sausage, we can whack around fifteen grams of fat off the original version. This restaurant boasts a unique "Texas roadhouse" ambiance. When you walk into any Lone Star restaurant, the first thing you'll notice is the crackling peanut shells beneath your feet. When seated you'll get your own free bucket of peanuts to munch on, and feel free to toss the shells onto the wood plank floors. Western music plays over the speakers, and every hour or so the wait staff breaks into a honky tonk line dance next to your table. 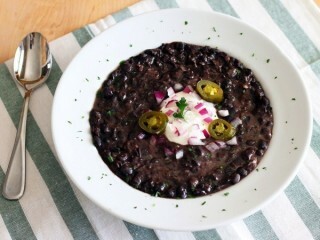 The spicy black bean soup is a popular item on the Lone Star menu. Here's a way to make a version of your own that can be served as an appetizer or as a meal in itself. 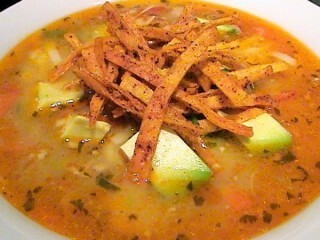 It's great with a garnish of freshly diced red onion, jalapenos, and sour cream on top. Menu Description: "A unique presentation of an Australian favorite. Reckon!" Here's a great way to start off dinner. 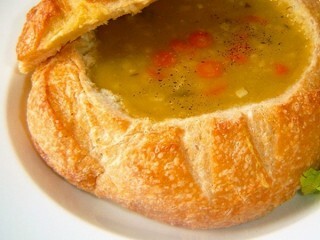 The menu claims the Walkabout Soup is an Australian favorite. 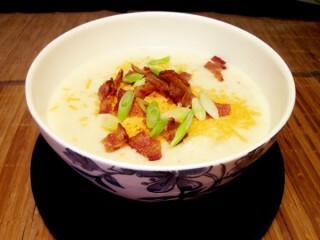 While that may or may not be true, this creamy onion soup is at least a favorite of Outback Steakhouse regulars. If you can boil water and slice onions, you'll have no problem with this easy-to-make version of the chain's top secret formula. Sandy Beall managed Pizza Huts while a freshman at the University of Tennessee to get out of fraternity house duties. It was just three years later that Sandy's boss at Pizza Hut would favor him with a nice gift: $10,000 to invest in a dream. With that, Sandy and four of his fraternity buddies pitched in to open the first Ruby Tuesday on the university campus in Knoxville, Tennesee, in 1972. Sandy was only 21 at the time. 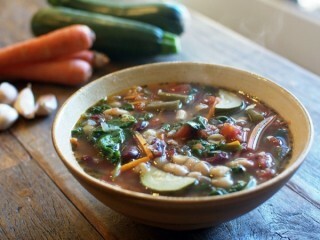 Here's a great soup that can be served by the cup or in large bowls as a meal in itself. Along with the potatoes is a little bit of minced celery, some minced onion, and a small amount of grated carrot for color. An additional pinch of cheese, crumbled bacon, and chopped green onion make a tasty garnish just like on the Ruby Tuesday original. Rather than going through the tedious (and more expensive) task of steaming fresh clams and dicing up all the good parts, we can use the more affordable and convenient canned clams found in any supermarket. Just remember to not toss out the clam juice in the cans when you open them, since you'll need that flavorful liquid in the first step. 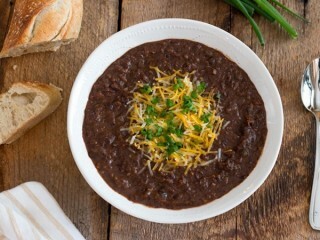 Menu Description: "Chili made with select cuts of tender pork and beef, pinto beans, Piranha Pale Ale and topped with melted jack and Cheddar cheeses, sour cream and green onions." 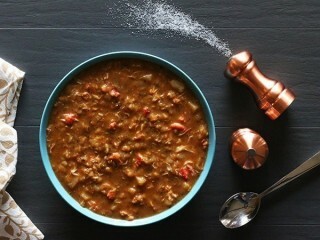 There's nothing that warms the soul like a hot bowl of spicy chili. And since BJ's is a brewery, the 54-unit chain adds an ingredient that makes a steamy bowl of red even better: beer! The Piranha Pale Ale that's poured into the chili pot is very similar to Bass Pale Ale, so that's what's called for here in our BJ's Pale Ale Chili recipe clone. Sierra Nevada Pale Ale also works well. 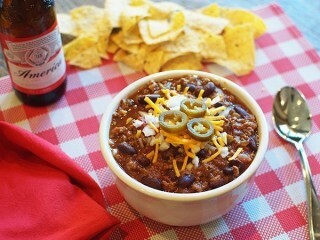 Toss everything into the pot over the heat, and in about 90 minutes you'll have enough chili for eight hungry mouths. 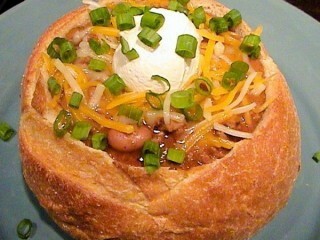 Serve up the chili in bowls, or more impressively, in the center of hollowed-out sourdough loaves. Nice. 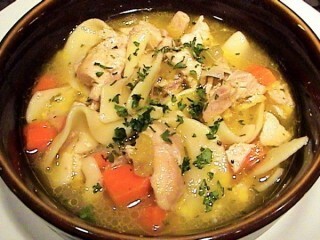 One of the most popular and hard-to-pronounce items on the Olive Garden menu is found in the soup column. 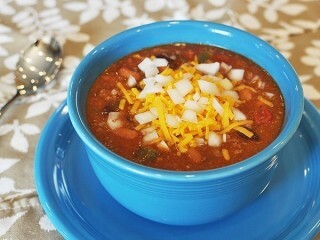 It's more like chili than a soup, really, with all those beans and veggies and ground beef in there. The reduced-fat grams in this clone are especially important when we consider that this dish makes an excellent meal by itself, and you may want to eat more than the 1 1/2-cup serving size measured for the nutrition stats. We'll keep the added fat to a minimum by sauteing the veggies in what little fat is not drained off from browning the lean ground beef. 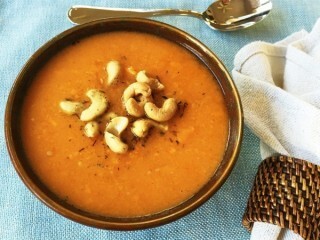 The soup will fill your mouth with flavor so it won't matter that we aren't adding additional fat. You'll have a hard time distinguishing between this version and the original. Try it. This recipe makes about eight 1 1/3-cup servings. If you can't eat it within a few days, it freezes well. 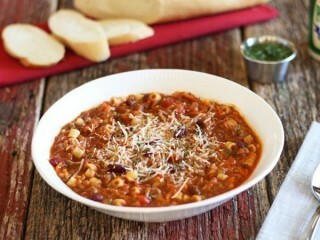 Menu Description: "White and red beans, ground beef, tomatoes and pasta in a savory broth." 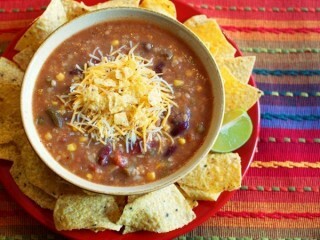 It's amazing how many lousy clone recipes for this delicious chili-like soup are floating around. 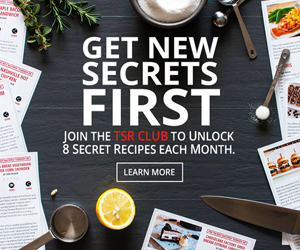 Cooking message boards, and questionable sites that claim to have "actual restaurant recipes" have for years passed off numerous versions that disapoint home chefs. 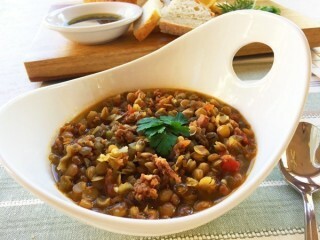 Other formulas leave out major ingredients that you can clearly see in the real thing, like the carrots, or ground beef, or two kinds of beans. Others don't even get the pasta right—it's clearly ditalini pasta, which are short little tubes. 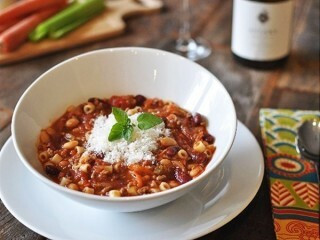 If you want the taste of Olive Garden's famous Pasta e Fagioli at home, this may be the only recipe that will live up to a side-by-side taste test. Beware of imitation imitations! After years of fielding requests to clone the delicious signature soup from this 100-unit chain, I was finally able to secure a couple carry-out samples from Max & Erma's at the Cleveland airport while I was there on biz trip. Wrapped in a bundle of napkins and tucked into a carry-on bag, my samples arrived home in Vegas still warm and ready for analysis. 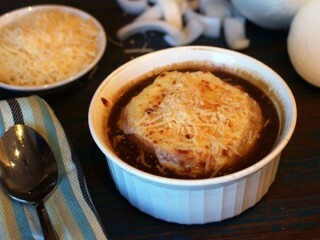 For this one you'll need some white and dark fillets of chicken and a half pound hunk of cheese to shred. 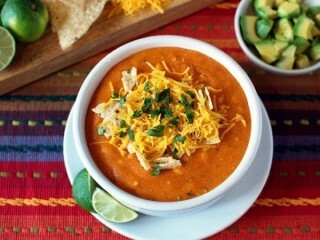 It's all that Cheddar cheese that makes this tortilla soup so good. 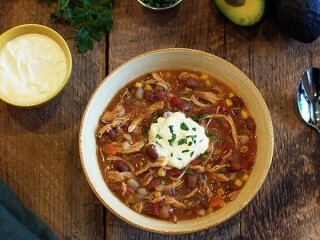 And you'll definitely want to shred your own, since the pre-shredded stuff—while also more expensive—just doesn't melt as well in the chicken broth as cheese that's been shredded just before it goes into the pot. Update 2/8/17: This recipe may work better if you first make a sauce with the cheese before adding it to the soup. After step #2, combine 2 tablespoons of butter with 2 tablespoons of flour in a medium saucepan. Whisk in 1 cup of milk until thickened, about 3 minutes. 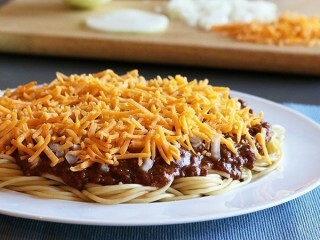 Remove it from the heat and stir in the cheese until it's melted. 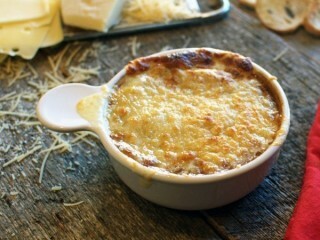 Keep the cheese sauce warm over low heat until you need it. 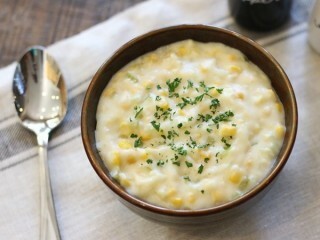 Reduce the cornstarch to 1 tablespoon and dissolve it into the chicken broth in a large saucepan. Add the chicken, sauteed vegetables, and remaining ingredients for the soup (except the cheese sauce) and bring the mixture to a boil, then reduce the heat and simmer 10 minutes. 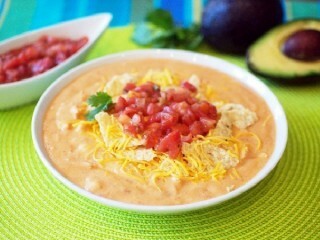 Stir in the cheese sauce and simmer the soup for another 10 minutes while you bounce to step #4. This soup is only served on Mondays at the Denny’s near my house and it’s not even on the menu. 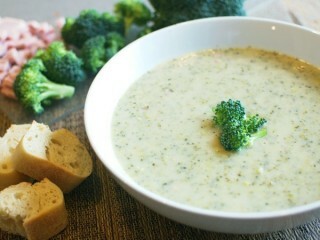 But of all the soups served at the huge diner chain this one tops the list for cloning requests we get here at TSR HQ. 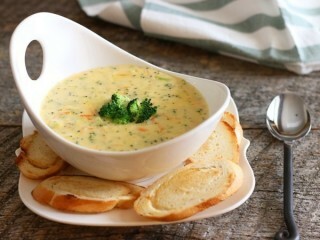 A home clone for this popular soup is beautifully simple: make a roux with flour and butter, add milk, shredded Cheddar cheese, chicken broth and broccoli, and simmer until thick. The only suggestion I would make is to shred the Cheddar yourself rather than using the pre-shredded stuff. 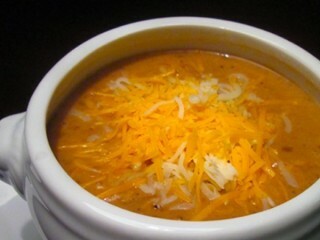 I find that in soups like this freshly shredded cheese melts much better, giving the soup a creamier and less grainy consistency. There are several delicious variations of Wolfgang Puck's butternut squash soup recipe floating around, but as far as I can tell no version comes close to duplicating the amazing stuff served at his flagship restaurant. At the Las Vegas Spago in Caesar's Palace I recently slurped up the slightly sweetened, pale amber masterpiece with the perfect combination of spices, and then finagled two bowls to go. 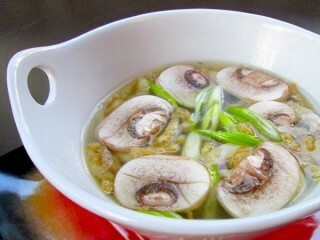 Since the soup is completely smooth, running it through a strainer revealed no solid evidence of ingredients; only black specks of various spices were visible. This one was not going to be easy. After many attempts I finally recreated the subtle background flavors with chopped leek slowly sweated in butter, and one gala apple. I discovered that the apple contributes a perfect sweetness. The rest was easy: poach the leek, squash, and apple in broth until soft; blend everything until smooth; then reheat with the cream and just a little brown sugar. 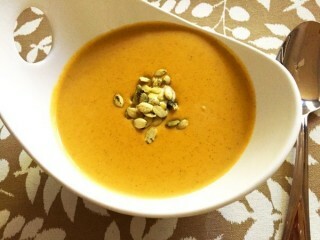 This Wolfgang Puck butternut squash soup recipe is my new favorite. 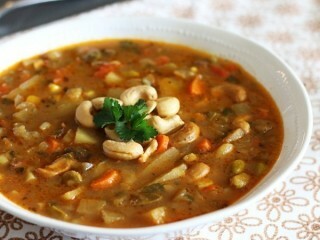 Menu Description: "A tasty twist on a family favorite. 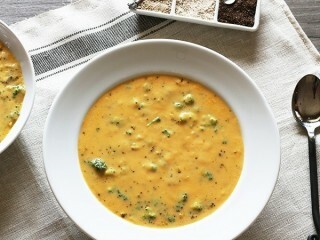 Red, ripe tomatoes slowly simmered in a rich cream sauce and seasoned with basil and select herbs." 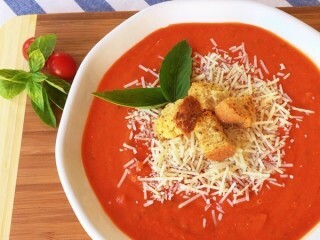 This easy Applebee's tomato basil soup recipe requires two large cans of crushed tomatoes, and your soup will still have the impressive taste and texture of gourmet tomato bisque requiring fresh tomatoes and more work. 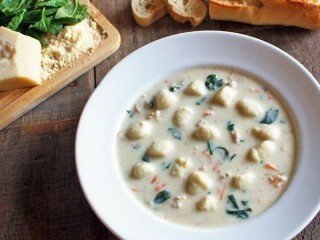 You may notice that the large amount of basil used here contributes an overwhelming flavor and aroma when first added, but as the soup simmers the herb mellows to create the perfect clone of the original. And there's no need to make croutons from scratch for the garnish when you can buy lightly seasoned packaged croutons in just about any market.